Plants are usually the star of Chicago’s Garfield Park Conservatory, but a forthcoming art installation will help brighten the Jens Jensen gem with lights, mirrors and prismatic panels. Local firm Luftwerk Studio is calling the project solarise, and promising a site-specific “series of immersive light and sculpture installations.” According to a press release from Mayor Rahm Emanuel’s office, solarise is part of the Chicago Cultural Plan—a diffuse planning and marketing initiative launched during Emanuel’s first term to crowd-source ideas for new cultural programs in the city. 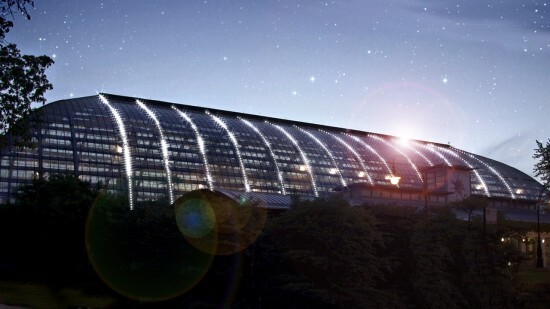 Solar-powered LEDs will illuminate reflective panels and sculptures in the conservatory, which is open every day of the year from 9:00a.m.–5:00p.m., with evening hours extended to 8:00p.m. on Wednesdays. 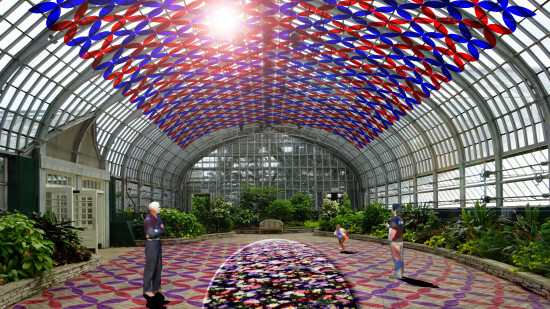 The installation will be on display at the Garfield Park Conservatory from this year’s Autumnal Equinox to next year’s Autumnal Equinox, September 23, 2015 to September 22, 2016. • The Beacon: A permanent LED facade connected to the ribs of the historic Palm House. The Beacon will be the focal point of the exhibit and will be visible from both inside the Conservatory and from the grounds in front of the building. • Florescence: A sculptural canopy of red and blue petals that will cast colorful shadows throughout the Show House by day and by night. The Show House color panel installation will reveal the spectrum of light necessary for plant growth. • Seed of Light: A continuous interaction between water and light will create a ripple of shadows that will play out across the Conservatory’s Horticulture Hall floor. • Prismatic: An immersive prism sculpture in the Desert House will refract natural and LED lighting. A sound installation using plant material from the Conservatory collection will accompany the sculpture and lighting. • Portal: A series of mirrored sculpture panels will frame the Palm House reflection pond and the Fern Room’s waterfall. • Lobby: A light box that will play on Jens Jensen’s concept of the Midwest Prairie as a sea of all colors.